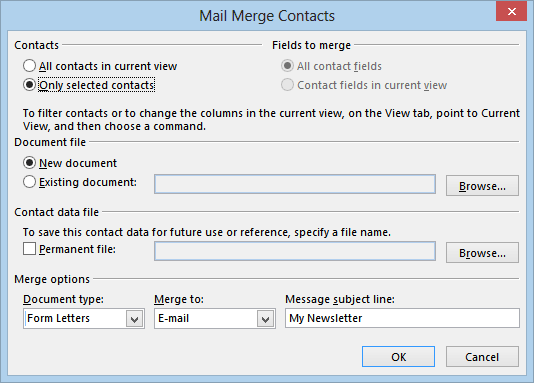 As you might know, Outlook benefits from the MS Word document mail merge capabilities, allowing you to apply mail merge in Outlook emails. 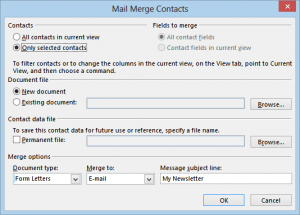 Basically, you can import Outlook Contacts and personalize mass emails (mail merge), so you can email a newsletter to many recipients, as separate emails. 4. Outlook will open a new Word document window, where you can type and personalize your email content. As a side note, please pay attention to the use of the words “mail” and “e-mail” in Word. By “mail”, Word actually refers to the physical mail (you know, the one delivered by your mail man, in an envelope). Since Word can perform both mail merge (printing mass mails & envelopes) and e-mail merge (composing & sending mass emails), make sure you don’t confuse the terms, on the Word interface menus. It may sound trivial, but many get confused by the use of both terms in the same window, especially since more and more people refer to “e-mail” as “mail”. Word will now generate separate, personalized outgoing emails for each imported Outlook Contact. Since the emails are composed using MS Word, please be aware that (if you are designing a fancy email with images and formatted text) the email content will likely contain design attributes that are not going to be displayed correctly on other email client applications. So it is important to always send a test mail merge message to your own email addresses, before sending the mass email to your contacts. Also, Word is not capable to schedule the mail merge emails in Outlook, so Outlook will be instructed to send ALL your mass emails at once. If you are about to send lots of emails, you are likely to receive at least a temporary email account suspension from your mail server provider. Even sending as few as a hundred emails can get your account suspended. So always check with your mail server provider, before sending mass emails. 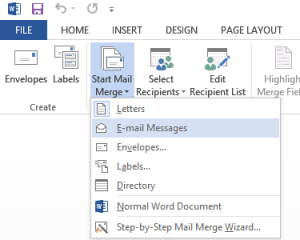 If you want to learn more about bypassing the Outlook mail merge limitations, please see our comparison chart between the Outlook mail merge system and Easy Mail Merge for Outlook. 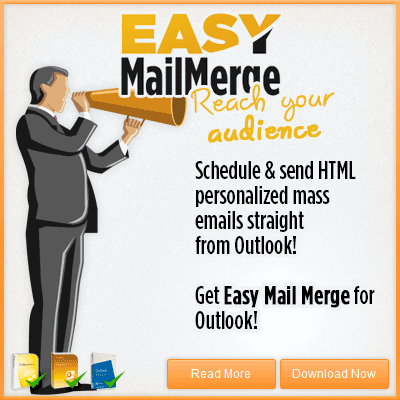 In our view, Easy Mail Merge provides the best mail merge experience that you can get in Outlook.